Zootopia, or Zootropolis as it is known in Europe, is Disney’s latest animated feature in a legacy that spans over eight decades. Its premise is a tried and tested buddy-cop flick that pairs rookie cop Officer Judy Hops with master-hustler Nick Wilde on a missing persons, or is that animal case. We sat down with Directors him in Brussels to talk about his latest venture, Zootopia. Notes: This interview was concluded between two roundtable discussions and a Q&A between Clark Spencer, Byron Howard and Rich Moore. For easy reading we edited these interviews for clarity into one longread. Enjoy. Hi Clark! For three years you have worked the zoo of Wall Street, how would you compare it to the zoo of Hollywood? Clark: (Laughs) That’s a good question. Both are the same in the sense that you always try and figure out how to get something done. In Wall Street, you get a deal done with mergers and acquisitions. So two companies that come to an agreement on merging together, and what is the cost in that. Here in Hollywood you really try and figure out how to get this whole movie done. When we start it’s just an idea and we have to figure out how we develop the technology to do the movie. We knew fur was going to a be big part of this film. We have never done fur that was this complicated, so we had to develop this. We had to develop how this world looks like, and build every aspect of the world. We have to figure out the story. So we sort of doing the same thing, which is how we get all these different groups of people to come to an agreement on what it is, together with the directors. So there are all these artists who are part of it. So it’s that same kind of a concept of ‘how do you service that in-between person that gets everyone to the table and come to a final agreement on moving forward and saying yes an idea’. With Lilo and Stitch, Wreck-It Ralph, Bolt and now Zootopia, you have made very diverse animated films. But what connects them as Disney Movies? Clark: What I like about Disney is that we make all type of movies, and that is a great example of different types. But they always have a few things in common. One is where we make movies that are for people of all ages around the world. Two is we always try and make movies that have both humor and emotion. Humor, because people want to be entertained, but emotion because if you don’t emotionally connect to the characters, I think you’ll still enjoy the movie, but never watch it again. Clark: So at Disney we always try and have our audience fall in love with our characters, so from an emotional standpoint they will want to see the movie again. In this movie, in the theme parks, or wherever that might be. And then the last thing, which is the interesting one, is that every movie has the name of Walt Disney on it. And in some way we all feel a responsibility to create a great story with great characters, because we are living in this legacy of ninety year history at Disney. So I think that is kinda the link. A film has to last. It has to feel like it belongs as a part of the Disney Film Library. As a producer you also have to predict what is going to happen after the film, if there will be a tv show or other movies. 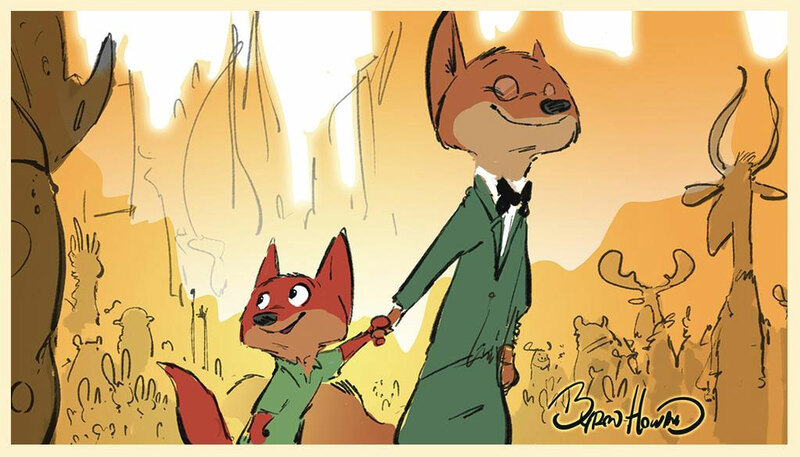 What would you like to develop from the world of Zootopia in the future? Clark: Well, when we make our movies, we only make it it for one film. We put all of our focus on that, because unless the film is successful in terms of the story we created and the audience finding it, there will be no other future for it. But I think with a movie like Zootopia where you have this amazing city that has all these districts and all these animals in it, there are so many stories you could tell. For us the ultimate sense of success, if you will, if the audience wants to see another story told with these characters again. Because if they do, then that means we really created a story, where these two character Nick and Hopps, where audiences fall in love with. Only then then fall in love with the world of Zootopia. So for us it would be to create another film that continues the story. Because there is so much we create on these movies that do not end up in the final film. They’re ninety minutes long, so you can’t put in every single thing you want. There are all these districts that you want to go and spend more time in. And you understand that there is so much work done to think about how these districts work that we would love to be able to share, but just can’t because we don’t have enough time. Is it the same with the technology? Because for this film you developed the Keep Alive technology. But it will certainly be used in future projects. But was it developed on, let’s say, your budget, or on Disney’s budget? How do things like this work? Clark: It’s actually on the films budget, because we do look at it because we are not making it, but we do know other films will benefit from it, but we benefitted from the work done on the snow done for Frozen and take it to places they couldn’t go to. We get to these films much earlier. Byron was on this film for five years, but technology only got eighteen months to develop the techology for this film, so you get the technologies as far as you can go and then you have the stop, and then the next film can take it further. So Keep Alive is this new technology making that there always is a a level of movement, be it wind moving leaves in a tree or blowing through fur, which especially with the fur is a huge hard thing to do in computer animation. And all of that will now be realised in films that come out after us, so they can benefit from that type of technology. What was the most difficult part of this production? Clark: I think it really was that fur. It was very multilayered, because at first we wanted to go as realistic as possible, so the look team that creates the look for our characters spent a year just studying the fur of the sixty-four different species in this film. For example a polar bear’s fur is not white but transparant while the fur of the fox is dark at the root but gets light at the tip. They studied even the rabbits to just make it all so realistic as possible. If you make a film with humans and you create hair, it’s the same hair type on every human. Some might be curly, straight, blonde or brunette, but it’s the same quality. But each one of these sixty-four different fur grooms are all very different. On the giraffe alone there are 9.2 million hairs. So this is a HUGE task we had to do. Then we take that, and find that when you light that different type of fur, it also lights different. From the clear polar bear fur to the dense dirty fur of your regular sheep. So our lighters can’t just put in one set of lights as it would be possible with a ‘human’ movie. So in every shot, each animal has to be lit differently with all the different levels of density of the fur. And then the next layer is to put clothes on top of that fur. So you are then dealing with fur penetrating through the clothes and how those clothes move. And most importantly, animals don’t have shoulders. Even if you put clothes on them, they still don’t have shoulders. And we don’t want them to have shoulders, because then they’ll look human. We don’t want that so we had to sit there and think about how clothing will actually fit, on top of an animal. That one decision of having realistic fur led to all of these things that we had to figure out technically and made it very complex. This will be Composer Michael Giacchino’s first score for a Walt Disney Animation Studios feature… How were you able to pull him away from Pixar? Clark: Michael is amazing! And this is what I love about him; he has to connect to the film, or he won’t be able to write the score. So he came in, we pitched the movie to him and he fell in love with this story of this rabbit who is trying to figure out how she fits in this world and this fox who has the feeling that he has no choice but be considered a sly fox. He said: “I’m going to go away for a week because I need to think about it. And when I get an idea in my head what we might do musically, then I’m going to say yes. But if I don’t, I’m going to say no. And it’s not because I don’t like you, but I have to connect to the project”. So he came back a week later and said “I have a thought”. Two months later he comes back and has written an eight minute piece of music. “This piece of music is not anything that will go directly into the movie. This is just eight minutes to tell you how I emotionally feel about this movie.” And it’s going to take you through meeting Judy, her going into the city and becoming a cop, where she then meets Nick, and then there’s the emotional side. And then we end in a sense of conclusion. Just to give you this arc in the film”. And it was this most beautiful eight minutes of music you ever heard. It was amazing. He then writes the actual score, so I think for us, what was great is that he hadn’t done a Disney animated film, but he did fall in love with this one. And he was such a great collaborator on this film. I think the score is amazing. So Bernie comes in on the first day of scoring, and he has taken his entire drumset, and on top of every drum put a cymbal on top of the animal skin part of the drum. Also he brought these two big metal oil drums and his bass kick drum is a wash pan made of tin,so it always has this sound of metal. Even so there is still the skin of the drum and it has certain aspects that you know, there is still that sound of metal. Every piece of music in the score is used with that set of drums. It’s amazing! Really smart thinking from that part. ZOOTOPIA. ?2016 Disney. All Rights Reserved. Do you see any future for movies in VR? Clark: Well, it’s funny you ask because we have been talking about it, just between the directors and myself, I think it could be pretty incredible. We have to see how the technology continues to evolve, and see how people embrace it. Because these movies take a long time to make, and there is aspect to it that the audience has to evolve into wanting to see something in virtual reality, but it could be really incredible. Rich was talking the other day about that we build all of these sets, so they all exists. Technically you can go into the world of Wreck-It Ralph, Finding Nemo, Tangled. You can go into these three-dimensional worlds and you can actually start to move around, just as you could on a soundstage. But on the soundstages they tear their sets down after shooting, we don’t. So I think there is a really interesting future for virtual reality and how we tell our stories and get our stories to be even more immersive. Because we build everything, our process is almost perfect for virtual reality. Clark, You hired Rich as a second director, how do those Director pairings happen at Disney? Clark: Well it’s a couple things. Byron was started personally building this film, and the film got bigger and bigger and bigger in terms of the world. And there is a point where you need, as a producer, several minds, several directors on it because you can’t have one director working in animation and one director working in layout. Or you can use the benefit of using both directors in terms of their storytelling. 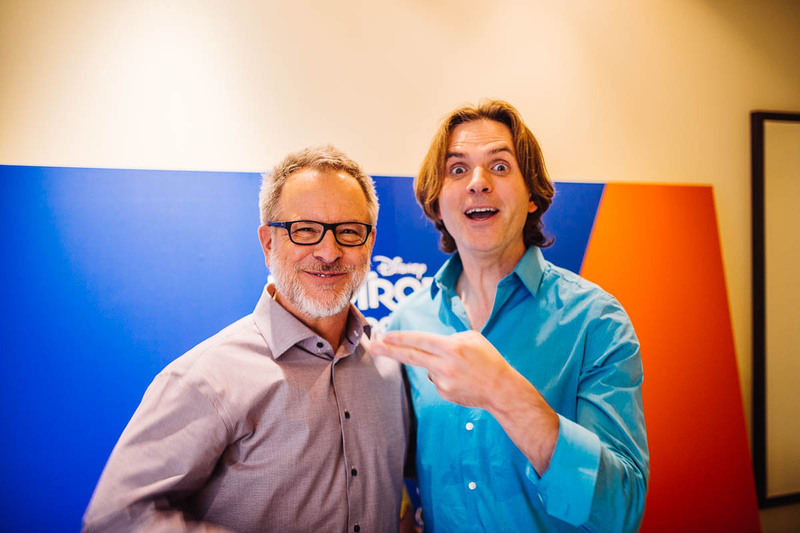 And I worked with Rich on Wreck-it Ralph, and I worked with Byron on Bolt. So for me I thought this was kind of a really great pairing between these people. It’s one of those things I love about our studio: everyone is very collaborative. People will work on each others projects to help to make the project the best it can be. So Rich came onto the project about eighteen months ago, so the two developed it from that moment forward. And they’ve been a great team. I mean, they didn’t knew each other that well, just as colleagues in the same building. But by working creatively together have become this incredible team. So let’s bring in Directors Byron and Rich. Hi guys! It was the first time that you guys collaborated, how did it go? Rich: It was fun, right? Byron: It’s been very fun. It’s always great to have other directors collaborate, because it’s such a long process, where you have to make thousands of decisions so it’s great to have partners to check in and see if we’re telling the story the right way. And it’s the makes the journey a lot better for us. Rich: It’s a BIG movie, it’s a big world, a lot of characters, a pretty complex story. It’s a mystery story, in a short amount of time. I don’t know if one person could have kept track of all that. Animated movies are kinda different in that way. It’s a million different pieces scattered everywhere that you have to keep track off. This one might have been too much for one person. Byron: Yeah, I think so. Rich: Maybe the great Brad Bird. Byron: Yeah, Brad would’ve done it. Rich: He’s crazy! (hilarity ensues) But other from that, yeah, it’s too much for one person. (Talks into the recorder: “I kid Brad”). Thematically speaking Zootopia is a very ambitious film. In that you have your main protagonist confront her own prejudices, before arriving at a more nuanced truth, namely that things like savage vs docile, bad vs good are false binaries. And in that sense the film puts a really invented spin on the much overdone ‘everyone can be anything’. Was shattering these one-dimensional stereotypes one of the main things you wanted to accomplish with these films? Rich: I don’t know if it was a main thing, but it was an important thing. Because when we talked about early on this theme of “everyone can be anything and can make the world a better place”. Those are the sort of platitudes that sound good, but that doesn’t apply to some people. And we found, together with our writers, that can’t end up in that place. It’s fine that she believes that. How about at the end she understands more about this? If she matures about it, so it takes on a greater meaning. It is a great evolvement from her character. She begins that way, very simple. And I can remember as a young person coming out of college thinking “oh yeah, I know how the world works”. And then launching into the world and realising it was very different. We wanted it to feel like that. So it was writers Phill and Jareth that really pushed that we could not end up with a platitude. Judy is not going to prove that. And that is where that final speech at the end, about that life is messier, and that she understands that part. that what she was thinking while going into this world is kinda the equivalent on what you would see on a bumper sticker. To me that shows real growth that is really different than other Disney Hero Growth moments. Byron: Much more complex than usual. Rich: It was very self-reflective. Over the course of the story you see it’s not a sterling hero. She has her flaws too. But she grows with self examination. To me that it, if the sterling eagle scout of a character can have a blind spot .. Yes, that is what makes her interesting as well. Flawless heroes are boring. Rich: That is what we tried to do. We love the flaws on our characters. Sometimes in an animated film the main characters are these kind of perfect. To me, that doesn’t feel like people but a character. In other hands she might be be a tad too perfect. But I like her flaws. During production you switched from Nick as a main character to Judy. What where the complications from doing that? Byron: We’re gluttons for punishment. (both laugh). No, one of the things we discovered, and that is why it takes so long to make these kind of movies, and why we put so many different versions together along the way, is that telling a story of Zootopia is really tricky. We wanted our audience to fall in love with this city, and care what happens to its citizens. So about the version where Nick was our lead. He is very cynical. He grew up here in Zootopia and has been mistreated around by the system, so he doesn’t like the city very much. So if you’re an audience member and you discover the city through his eyes, you are biassed towards disliking the city. We found that problem over and over again. I think we had a strong version of that version of the film, but there where certain things that where not firing off to the point to where we said after a long while, just let’s try and see what would happen if we put Judy in the lead of the movie, and see what the movie looks like through her eyes. And as soon as we did that, all of these issues started to clear up. Which was good and bad, because we knew that was the answer, but the bad because it meant that we already had a lot in production. So we kinda had to break it to our crew who had put months and months and months into creating all of these scenes, locations and characters. Because we threw out characters, whole sequences. We really had to strip the movie back to its bones, because I think the characters stayed mostly the same, the core characters. But then this new arrangement allowed us to go beyond what we had for them and allowed these characters to grow and become something more. It allowed us to tell the story in a more nuanced way, which also paved the way for the audience to discover everything, while in the other version it was all much more in your face. It is much more layered and nuanced, and you can enjoy the comedy, you can enjoy the fun of the world without being burdened from frame one with this slap in the face. We never want to make preachy message movies. 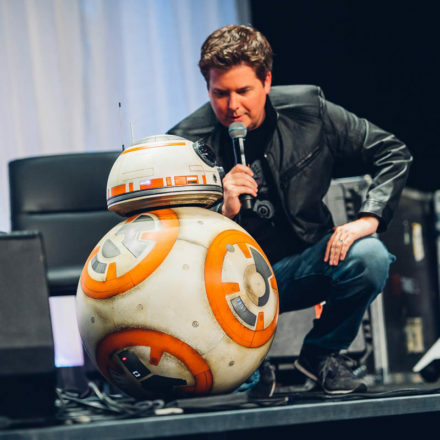 We care about characters and storytelling. These layers should always be something that audiences can discover for themselves. Rich, you worked on The Simpsons and Futurama. You directed some of the best episodes on those shows like Monorail, Cape Fear, Flaming Moe’s. What was it like to be part of such an iconic show on arguably its creative peak and how did that become a learning school for a rich career in animation? Rich: It was an amazing opportunity. Lucky at the moment it was happening I had real clarity that this was something special. I was 24 when I started working on The Simpsons, and I only knew them as the shorts from the Tracy Ulman Show, and I loved Matt Groening’s and his comics and the books he would put out. I knew it was real special that they where going to turn those shorts into a TV show. For one thing this was groundbreaking, as back then in ’89 there has not been a prime-time animated show for a long time. It was unheard of that they where going to put on cartoons in prime-time again. I was working on it with David Silverman and Wes Archer who where the other two directors on the show who worked on it since the Tracy Ulman Show. There where a few new directors who came on where some of the old veterans who knew how to make a show like this, they almost sunk The Simpsons. They didn’t know what The Simpsons were about. They came from a different age of directing shows like He-Man and Saturday morning cartoons, where these things where 30 minute long toy and cereal commercials. It was like a different school of comedy and animation. Fox almost decided not to put the show on the air, because when the first show came back from the animation house in Korea it was a mess. These people where let go, and I got very lucky. I had storyboarded the very first Christmas Special, and the producers of the show where: “This guy seems to know what’s going on. He seems to understand the show.”. I had experience from CalArts for making films, so I knew all the aspects of every job and how to direct that, so at 24 they said “you’re a director”. Okay .. I and I was just dumb enough the do it. (laughs, and in a squeaky voice) This will be fun. It was a huge challenge and a big undertaking but incredibly fulfilling and the greatest on-the-job training a person could have had in animated comedy day in and day out. Doing that job and working with amazing actors, writers and animators. It’s more special looking back now than back then. At the time I knew this is very, very good material. If I do not give it its due, I am letting all of animation down if I do not give it my everything to make it as best as it can be. Then I never get to complain again that there are no good projects in animation, because there it was. Did you get some voice talents from those days? Rich: Yes! John DiMaggio, who plays Bender in Futurama, plays the Elephant ice cream vender named Jerry Jumbeaux ..
Byron: Jerry Jumbeaux Jr. .
Rich: .. Jr. Yes. (laughs). So that’s John. The voice of Mr Big is Maurice LaMarche who has done a lot on Futurama and The Simpsons. That’s him doing his Marlon Brando impersonation. That’s his voice, but pitched up like on of those little mice in Cinderella. So it’s fun work with new people, but also bring in some old friends. Rich: Whenever he would stand it wouldn’t sound right, he’d sound like DeNiro. So we had to make sure to have a chair for him to slump in. I had both of them as well in Wreck-It Ralph. I like seeing them. It’s basically an excuse to hang out. (Laughs again). Do any of you have cameos in the film? Byron: Yeah, actually we do! I am one of the noisy neighbours who walk by as Judy gets into her appartment. And then my friend Rich here ..
Rich: I play a very bad ram. Byron: Dough the ram. The shooter of the serum. I think you’re also a wolf? Rich: I am, I’m also a wolf. The one telling Gary not to howl. Until I also give in to the temptation. Clark: This is the amazing process. We build these films way before we necessarily bring out the actors. And so as a result we all have to play the voices in the beginning. Anyone who is in the building who has any ability to get behind the microphone gets dragged behind it. The directors have the best point of view of who that character is, and what kinds of voice it needs to be, and then we have this interesting moment of ‘are we going to go out and bring in an actor from the outside, or are we doing to use on of these guys from the inside’. And then I’ll tell you over the course of time if you have something that is really working, if we really feel if that is who the character should be then we go with it. why is often times. Clark: Sometimes reluctantly, for these guys. Rich: And then John Lasseter will say “no, keep it in, it’s good!”. Clark: Because there is something about it, that you fall in love with in this version, that you can’t imagine it any other way. And it really does brings something special out. These guys made Wreck-It Ralph, Bolt, Tangled, and usually these guys are in there somewhere. Byron: That was the case with the Sloth voice. That voice was Raymond S. Persi who was one of our storyboard artists. Raymond came in to do scratch for us, and he has a bit of a nasally voice. Rich: He’s a really good actor! He played Gene in Wreck-It Ralph, the very nasty Nicelander character, and he did the scratch for Flash, the sloth. And when it came to cast the real voice, again John Lasseter said “No, it’s just funny. It’s good the way it i!”. Of course tt could be a great vehicle for a comedian, but it works so well, and there is a moment like Clark said, where you don’t want to mess with them with the mix or hoodoo of it. Something is working and it is making people laugh. Byron: That’s true. And Clark at some point was the voice of a squirrel who drove a nut truck. A lot of good nut jokes we cut out of the movie unfortunately, and Clark’s voice with it. This movie feels a lot more grown up than previous Disney movies with references to The Godfather, 48 Hrs, etc, that will entertain adults even more than children. Did you steer the movie in this direction? Clark: Well, Animation is an interesting art-form or medium, because it can be felt like it’s just for kids or parents with kids. And I think we don’t want that. We want everyone to come, and we want to entertain everybody, but we can only do that if we have humor for the kids and humor for the adults. And what is interesting in that about this film is that there are two directors. Byron comes from a Disney background. He always wanted to work for The Walt Disney Company and he started out in Orlando, Florida as a tour guide at the animation tour at Disney-MGM Studios. Once he got in his career just shot straight up. It went so fast and he became a director on Bolt at a very young age. But he is quintessential Disney. Rich More, didn’t work for Disney. He worked for The Simpsons and Futurama, and he has a very different sensibility and humor. He then joined Disney in 2008 and made Wreck-It Ralph. Clark: So these two together kinda combine this great one-foot in the Disney Legacy and one-foot in the ‘how do we create great entertainment for people of all ages’. And that is what brings in The Godfather and those pieces. Because Rich really pushed on those ideas.It is a nice thing to have, and I really hope the audience will discover that and know that animation can be for everybody. Byron: As far as the adult humor in there, we are adults making these films. We try to make eachother laugh. I think we want to have all ages relate to it. I mean, we always make it appropriate for kids and families. But it’s great. We can watch an audience now watching the movie, and can kinda wait and predict that ‘now children will laugh, now adults between 20 and 35 will laugh, and now adults over 50 will laugh. Especially with The Godfather reference. Kids are just laughing over the fact that a small shrew is named Mr. Big. Rich: And that everyone is scared of him. Byron: Yeah, and then the adults are going to get a kick out of the fact that the office is an exact replica of the office in The Godfather, and the hommage is so down to the letter. But you know who the real cinefiles are with the first shot they open the door and they see the set and go “hoohoo, I know where this is going”. Rich: They recognise the desk, the little chair and all the mice heads. Byron: It’s all so precise. There are a lot of Disney Frozen references. How do you decide on those references and jokes? Byron: Well, it’s funny, we where in the room with our story team, and those jokes often came from anywhere. Rich: I think Bogo’s speech was Phil Johnston, and he came up with that bit. And then the Duke Weaselton / Duke of Weaseltown one was I think was Jim Readon, our head of story. It was one of those collective dog pile of joke-type situations where everyone was thinking of it at the same time. Byron: It was so deep, because it is so meta! And Alan Tudyk who has been a bit of our Good Luck Charm for us. So we had a weasel, “can’t we have Alan come in and do this voice?”. Rich: It’s something that can only happen in a Disney movie. Byron: Frozen fans will go crazy! Judy uses a pink iPod Nano and FaceTimes with her parents, everyone is on their phones, they hitch a ride with Zuber. Aren’t you afraid the movie will quickly show its age? Byron: Those are indeed challenges, as we really wanted to make a contemporary film, because you know, you see everyone on their phones now. I think the fact that we can be contemporary about the humor with the story hopefully being timeless in itself. So Byron, you started out as a Cast Member playing in Disney’s sandbox, but now you’re a director. How did you experience this career growth? Byron: So I was going to this school in Washington state where I got fascinated by animation halfway through college. And my school did not teach animation at all, so I had no idea what I was doing. So I wrote to a bunch of big people in animation saying “I’m stuck in school, can anyone help me what to do”. I wrote to Chuck Jones, one of the great Warner Brothers animators, I wrote to Frank Thomas and Ollie Johnston and they wrote me those encouraging letters of “follow your dreams, commit to it, it’s a great career”. And I went down to Florida to this new animation studio that was being built there at that time. I thought “I’ll get in there, it’s no big deal, I can draw”. Byron: “I’ll just walk in there and they’re going to love me!” I get there and immediately they go like *SLAM*. “No, we don’t want you”. Byron: Just like Bogo! (at the same time). Exactly, this is just me in a rabbit suit that got rejected over and over and over again. It took me about two and a half years to actually get in to Animation. Rich: But tell them how you where working as a tour guide at the Animation studio. I really love this. Rich: Literally crying on the other side of the glass, wanting to be in their world. Byron: It was great and not so great being so close and yet so far. And I would see people of my age getting into these internships and being trained and move on to become animators, and I wanted that so badly. Eventually, the training manager took pity on me and let me come in and take figure drawing classes, and that helped me get into animation. What I do appreciate about that time is I got to spend a little bit of time in the parks. I get to see why people love Disney around the world, and it’s a very ethereal thing. Disney has been around for a long time, almost a hundred years. It’s an idea that people care about. They are very emotional about it, they grew up with these films, and there is a way that people connect to these films that I really recognise when people come to the parks. So I still hold on to that when we work on these movies, because we care a lot about these stories and we put so much of ourselves in them that we really want to land with audiences. Rich: That’s good that you have that insider seeing. Rich: For people who love it, it’s really personal. Byron: It is, they care about it a lot. And we want them to love these movies and want them to be timeless. We don’t think about them as these disposable cartoons that come and go. Final question for all. What is your favorite Disney Parks attraction? Clark: Ooooh… . That is such a good question. I mean, I love thrill rides, so I can be a big fans of things like Tower of Terror and that. But my very favorite ride as a kid and I still love it today is Pirates of the Caribbean. There is something about that ride that just takes me back, I think I must have been eleven when I first went to Disneyland and that ride was so magical for me. 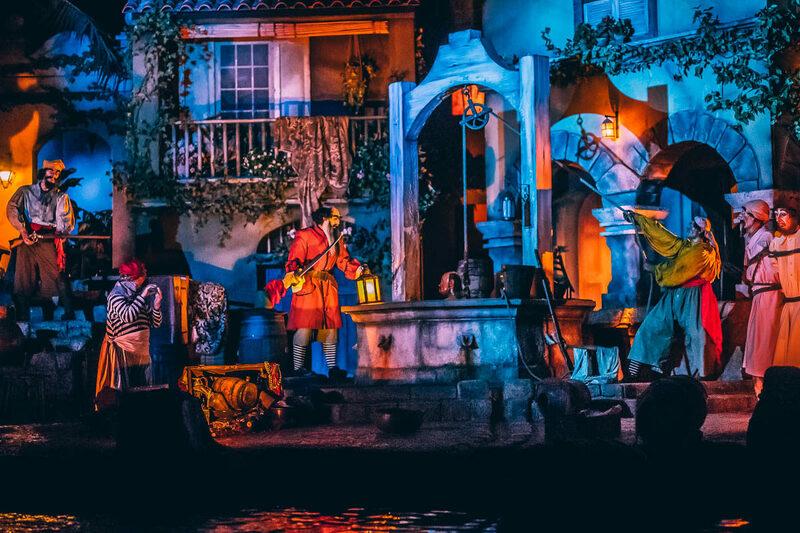 So whenever I go to any theme park, any part of the world, wether it is in Paris, Tokyo or Orlando or in LA, I always do Pirates of the Caribbean. I love that ride! Byron: It’s a really hard choice, but I guess Pirates. It’s the first thing I ever went on as a kid and I had no idea what was going on. Rich: It scared the hell out of me. I was terrified! Byron: When I was six, I had a friend named Jeff, who just been down to Disneyland and he told me about it. “There’s this part where a skull on the wall will talk to you. And you’ll go over a waterfall into the darkness. Rich: My brother did the same thing! He gave me a blow by blow description of what happened. Like Dunking the mayor! Byron: Dunking the mayor! Dead skeletons steering a ship and the lighting strikes! Rich: “And how are they doing this stuff!”. He said ‘they are all robots!” “Robots?!”. And I’m imagining science-fiction robots. Byron: I had this model kit from Pirates of the Caribbean of the skeleton guy who was steering the ship. And I was convinced this thing was haunted! Each night when I went to sleep it was facing the wall, and when I woke up in the morning it was staring at me. Byron: “What’s happening?” And I turned it back, and a few days later it was looking at me again, which really freaked me out. The following day I decided to get rid of this thing, I’m going to give it to someone else because I don’t like this model kit anymore, it’s freaking me out. Rich: Did it have some sort of rubber band or something? Byron: No, it was on top of the neck, like a snap-on model. Rich: Was it weighted or something? Byron: I have no idea, but the next morning my bulletin bord fell and smashed it to bits. (Slams the table, followed with laugher from everyone). Rich: So the bulletin bord saved you. Byron: That totally saved me, thank you bulletin board! So Rich, what’s your favorite? Rich: Since you’re talking classic ones, I’d say Indiana Jones Adventure. Byron: Oh, that’s a good one! Byron: Just the queue area is amazing! Rich: Everything leading up to it, and it’s just like ‘how much time and money have they spent on this’. Just crazy how hard these guys work at Imagineering. They’re just building something that you get in to, and you’re just having an experience. Every time I ride it I get in the middle of it. There is this part where you go into the main chamber and it has fire, explosions, a giant snake shooting lasers .. and the music from Raiders is blaring. And always at that point I think “someone built this for me”. Rich: It’s just .. we’re watching fire and snakes. The fact that someone took the time and effort to build something for no other thing. It’s not curing disease or anything, it’s just entertainment. A thrill. 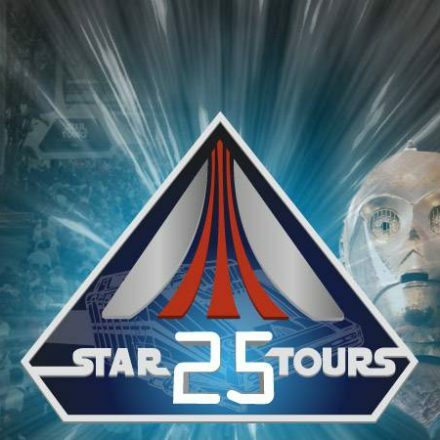 I guess that what got me into Star Tours at first. You’re so fully immersed into the saga. Byron: That is so right! Rich: The new ones are sooo good. Byron: I haven’t seen the new ones yet. I really have to go there! Rich: I’ve only seen two of them, they have a whole bunch. PR: Well, That’s all the time. Rich: Well, thank you guys!